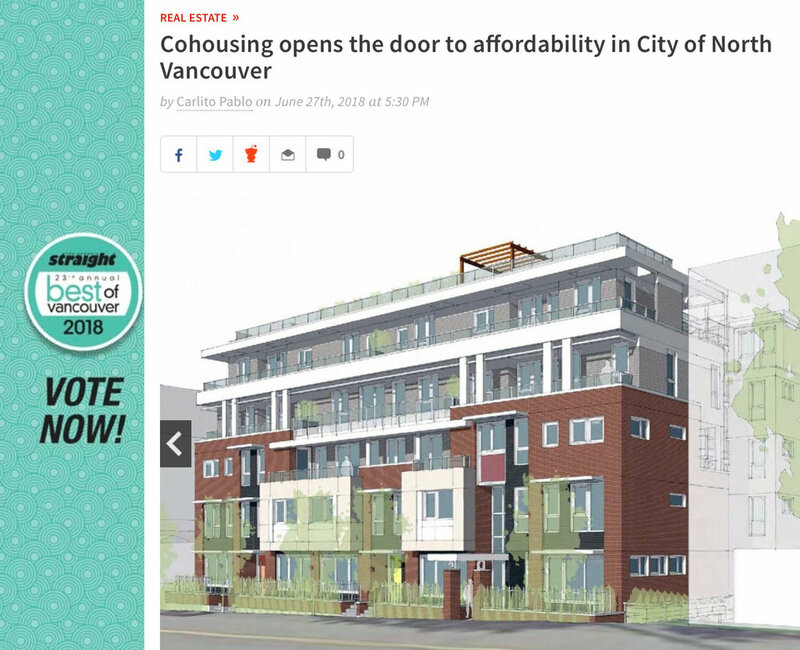 Georgia Straight article by Carlito Pablo: Cohousing opens the door to affordability in City of North Van (PDF). North Shore News article by Jeremy Shepherd: City of North Van may forgo cash for below-market housing (PDF). Star Vancouver article by Perrin Grauer: Co-housing brings people together in unexpected ways—as long as they can afford the price-tag, advocates say (PDF). North Shore News article by Jeremy Shepherd: Cohousing project moves forward in city (PDF). The Strait and Narrows podcast by Modacity: Episode 6 continues the conversation about housing and affordability, including Mackenzie Stonehocker's perspective as a founding member of Driftwood Village Cohousing. Vancouver Sun article by Pete McMartin: North Van councillor Bond's homeowning dreams get a licence to chill (PDF). North Shore News article by Justin Beddall: North Vancouver eyed for cohousing project (PDF). Guest post on The Minimalist Mom: Have you heard of cohousing? When The Minimalist Mom returned to Vancouver after several years abroad, she inspired us to share our solution for a more practical, more fun lifestyle in this unusual (ahem) real estate market. Vancouver Sun article by Barbara Yaffe: Cohousing another option in real estate market (PDF). In addition to homes for families like those portrayed in the article, Driftwood Village is aiming for a mix of unit types from 1 to 3-4 bedroom units.